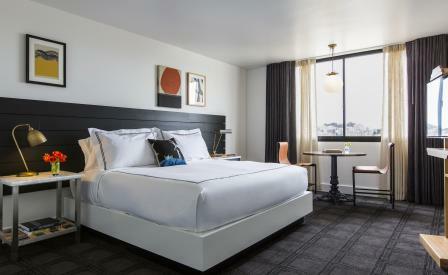 San Francisco’s newest boutique hotel The Buchanan, draws décor inspirations from its Japantown location at the crossroads of the gritty Fillmore District and chic Pacific Heights. Nicole Hollis Interior Design, also behind the interiors for Carmel Valley Ranch, translated the eclectic urban tapestry of the surrounding neighbourhoods into the diverse textures of crisp cotton, billowy linen, and worn leather. Harking to the Fillmore’s storied jazz clubs and Japantown’s Asian heritage, the dark lobby combines such distinct materials as hand-dyed indigo textiles, earth-tone pottery, and empty liquor bottles, which make up the ceiling. The feature wall of Japanese whiskey barrel staves was created using shousugi-ban, the traditional method that chars wood for exterior siding, while a mural by local artist Kelly Ording recreates Northern Californian landscapes as Japanese-style illustrations. The Far East references continue in the guest rooms, where you will find kimono-inspired robes and shibori-print pillows among the palette of charcoals, whites, and deep greens. The bathrooms depart from the Asian theme with its black quartz countertops, matte black frames, and fixtures from the all-American plumbing manufacturer Waterworks.